Welcome to Dons’ Place, “a locals’ bar for tourists” in Key West, Florida. Dons’ Place opened in 1998 by two friends named Don and has become a popular place for tourists and locals alike. The property at the corner of Truman and Grinnell is home to an inside air-conditioned bar, an outside tiki bar, and a liquor store, complete with a drive up window for ultimate customer convenience. In addition Dons’ has nineteen TVs for football and all sporting events. So stop by and enjoy a refreshing beverage, enjoy a game of pool or darts with the locals, or play a little corn hole and ping pong at the outside bar. 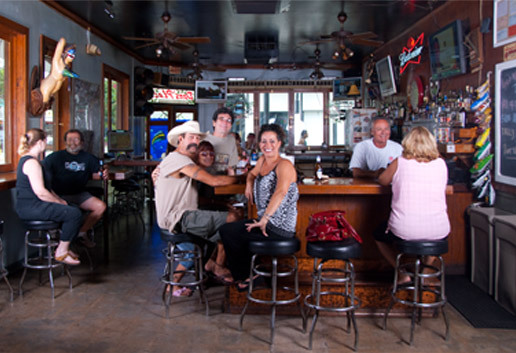 All of these activities are waiting for you at the last real locals’ bar in Key West- Dons’ Place- the first and last bar off of Duval Street.